Sometimes we think we understand a passage of Scripture. Then later, we read the passage again, and the Holy Spirit brings together smoldering thoughts from our lives, our studies, and even His Word. He ignites it, providing a brilliant illumination of God’s love for us. When you read Scripture, it’s a very good idea to establish the context. Paul’s letter is addressed to the church in Ephesus – a city in western Turkey. Paul, being a very well studied Jewish believer was attempting to assure the Gentile believers in Ephesus of their complete access to God. It’s critical to note that people from different regions and backgrounds have widely varying ways of understanding what is written. Knowing this is key to interpreting what Paul was saying to the Ephesian believers. Paul studied under Gamaliel, and as a Jew, his writings are very Hebraic. This means single words can be illustrated with pictures, providing definitive imagery versus an abstract notion of meaning. So, whenever I see the word “peace” in the New Testament (Eph 2:14), I’ll dig into the Greek to see if I should consider it “shalom”, which has a far more useful definition. Most think of peace as quietude, but shalom means to be “filled to completion with nothing lacking.” Jerusalem , “foundation of peace” doesn’t mean quietude, but the place from which all of God’s blessings flow. In Paul’s day, Jerusalem was site of the Herodian temple, the access point to God. 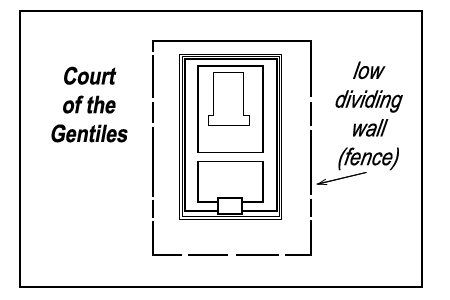 The temple grounds contained an inner court with the sanctuary building, a dividing wall/fence, then an outer court – “the court of the Gentiles.” Gentiles, even if true worshippers of Yahweh, were not allowed into the inner area. There was a sign posted at the inner court gates (through that wall/fence) that strictly warned Gentiles they would be responsible for their own deaths if they entered. It’s not clear if this warning came from God, or if it was a man-made regulation. That wouldn’t make much of a difference to the Gentiles who were being killed. This is the hostility Paul refers to in verse 14. Christ destroyed this wall by abolishing (katargeo – cease that prior work) the law of Moses (Torah’s commands and regulations – that is: mitzvot – good deeds). He did this – in his flesh. When I read verses like 15, I wonder – what does he mean? Jesus drove out the money-changers and animals, but there was no mention that he physically destroyed the wall/fence. Yes, Christ died upon the cross, but that’s not called for in Torah. How is it possible that Torah could be set aside without resorting to metaphors such as the perfect sacrifice? It appears Paul is saying that when Christ died, so did the Mosaic covenant, the purpose of which was to keep Israel holy and righteous. That “image” of what constitutes holiness (through the law) died with Christ on the cross. The reason I put “image” in quotes in that last sentence has to do with the meaning of the Hebrew word for image – demut (dalet-mem-vav-tav). Demut doesn’t simply mean a figurative photo-likeness. It’s true meaning is really about someone’s character – their actions. The Hebrew word for death is mut (mem-vav-tav). A person’s “image” is made up of the right-correct actions they perform (that’s the dalet-door, indicating life-changes). If no righteous actions are performed, that “image” is dead (the dalet/life changes are removed). After sinning, Adam’s work in the Garden was no longer possible. He (his image) was mut – dead. In fact, all of mankind was dead (via non-righteous actions) because they weren’t acting/being like God. Given that context, what Paul says next (verse 15b) makes sense: Christ’s purpose was to create a new man (new Adam) by which written Mosaic mitzvot (good deeds/actions) were not critical to judgement. His death on the cross replaced Torah as far as atonement was concerned. In Mt 5:17-18 Christ makes the claim that he’d didn’t come to abolish the law, but to fulfill it (pleroo – fulfill – make complete.) He lived a sinless perfect life, and in doing so, was the exact “image” of God in the flesh. According to Mosaic law, no one could do any better. Despite perfection in the law, Christ was rejected. There is the distinction that Christ was filled with the Holy Spirit and did not rely upon adhering to external laws and regulations – those written upon stones. This “image” of man is what Adam was in the Garden – God blew his Spirit into Adam. Christ – through his death, provided a new covenant, replacing the stone tablets of law with the Holy Spirit within to guide each individual person. In effect, each person becomes a temple of God, just like Christ. Another way of thinking of this – a believers heart became like the ark of the covenant, the “tablets” of the law placed inside them. Now the law (The Holy Spirit through Christ) would be carried whenever and where-ever they moved. In verses 17-20, Paul clarifies – the distinction between Jews and Gentiles is no longer made, because the old access point – the temple in Jerusalem, is no longer needed. Christ provided access to God through one Spirit. Then Paul begins making a comparison between believers and the temple in Jerusalem – with prophets and apostles as building blocks and Christ as the cornerstone. In Eph 2:21-22 Paul expands the process of building a temple using living stones. If you’re wondering where that idea came from – it appears to be a common word-play on the Hebrew words for stone (eben – aleph-bet-nun) and son (ben – bet-nun). John the Baptist wittily mocks the Sanhedrin in Mt 3:9 using this analogy. With temples, stones, sons of Abraham and access to God in mind, I think the Holy Spirit hit Paul with a clue-by-4 by reviving a past memory. In Acts 7, Stephen provides a lengthy sermon about God’s interaction with the Israelites, but from Acts 7:44-50 he focuses in on the tabernacle and the temple. Saul (Paul) was likely present – listening to Stephen’s dialogue. Later, he watched over the garments of the elders after they stripped them off to stone Stephen. By Acts 7:48, Stephen summarizes his point: “However, the Most High doesn’t live in houses made by men”. Here’s Stephen, surrounded by the Sanhedrin, stating God doesn’t live in the stone house – the Temple in which they serve. The very reason they are confronting Stephen is his speaking out against the “holy place” (Acts 6: 13) and against the law of Moses. Suddenly, in Acts 7:51 Stephen seems to lose it. He’s condemning the elders because they are resisting the Holy Spirit, as Israel had done throughout it’s history. The Sanhedrin, as guardians of the temple, are doing the very same thing to the Holy Spirit, that they did to Gentiles with the Temple! Further, God came in the flesh through Christ. God Incarnate – Immanuel – God dwelling among us. Christ, the true temple of God, filled with the Holy Spirit, God’s image (“the Righteous One”) and they didn’t show any lovingkindness (chesed) whatsoever. This is what Stephen was yelling about. This is the blasphemous hypocrisy of the leaders of Israel, who claimed they were acting on God’s behalf (in the likeness of God – demut), but were really diametrically opposed to God’s will. Y’shua came in the flesh – as a living Temple of God. He even refers to his flesh as the Temple – “destroy this temple and I will rebuild it in 3 days”. This referral is used against him in the mock trial. Notice, however, that His body is destroyed by the Romans, as a foreshadowing prophecy of the destruction of the Herodian temple in AD 70. When Paul wrote Ephesians, it was quite possible he was being held as a prisoner. So in Eph 3:1 when Paul attempts to summarize his mission to the Gentiles, all that imagery and the words of Stephen (who was taken prisoner, then stoned) must have came flooding back. It’s like Paul carried Stephen’s death all these years, and finally understood what Stephen meant about God’s real temple. I can’t help but think Paul fully understood Stephen’s suffering at that point. One cannot help but see the irony of stones being used to destroy Stephen who, being born again, was a true temple of the Living God. In Ephesians 3:2 Paul switches to God’s grace, his purpose in Christ for the Gentiles. No longer would he enforce keeping Gentiles out – but would now work to include them into the Body of Christ. This is a godly, righteous action, but not of his own doing. Eph. 3:12 sums up that access to God is always available to those who have become true children of Abraham. When we consider the temple in Jerusalem, it’s nothing but stone – it had no real life until the Shekinah glory came to dwell within. In fact, He filled it to overflowing – driving out all the priests (2 Chronicles 7:2). Likewise, we are dead, lifeless stones until God comes, dwells within and fills us to overflowing with his presence. When this happens, we have shalom – peace. It is with this imagery in mind that Paul begins praying for the Ephesians at 3:14-21. Please go – read it, and whatever your heritage, Jew or Gentile, may Christ’s shalom be yours too.